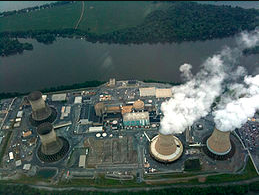 On March 28, 1979, the largest US nuclear disaster near Harrisburg, Pennsylvania when a partial meltdown led to the leak of a small amount of radiation into the surrounding environment. With the degree of complexity of its system, such an error compounded by human fallibility was inevitable. The failure of a relief valve caused the leak of nuclear coolant, which under normal circumstances would be noticed. However, the poor training and design of the user interface caused staff to believe there was too much coolant and initiate the steam pressure release. As such, the reactor began heating up and converting coolant into steam which prevented further coolant from replacing it. The heat exposed the core which leaked into the coolant and was carried beyond the containment zone. While the amount of this radioactive material was very small and unable to harm humans the failure of the system shocked the public. Anti-nuclear energy protest spawned around the country, the largest being in New York City, with crowds reaching 200,000 people. Such an impact on public opinion also harmed the construction of further nuclear plants. Previously the growth of nuclear power had been ever increasing, but after the accident, it was halted in its tracks.